I love the wonderful soft colors of sea glass, but I’m not much into collecting it for the sake of collect. That’s why I some taken with these sea glass craft in this roundup. 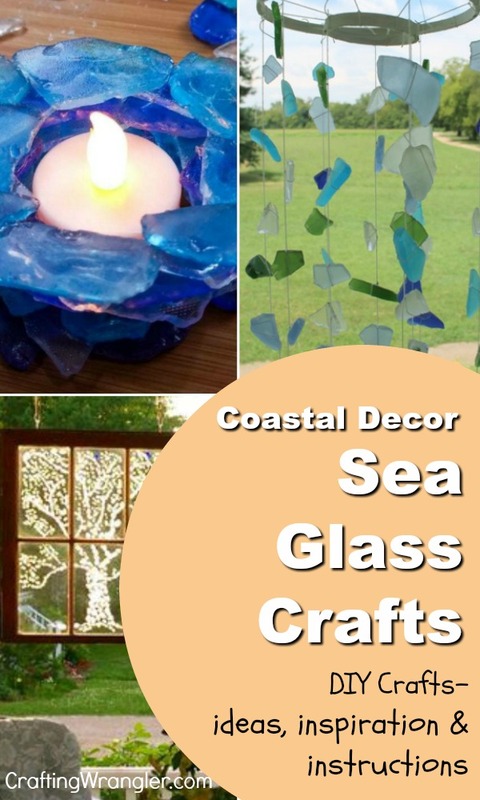 That, and they do make some beautiful DIY coastal decor ideas. Sea glass is nothing more than broken pieces of glass, such as bottles, that have made their way into the ocean. With years of tumbling in the ocean water, the hard edges are softened while the sea water etches the glass its frosted colors. 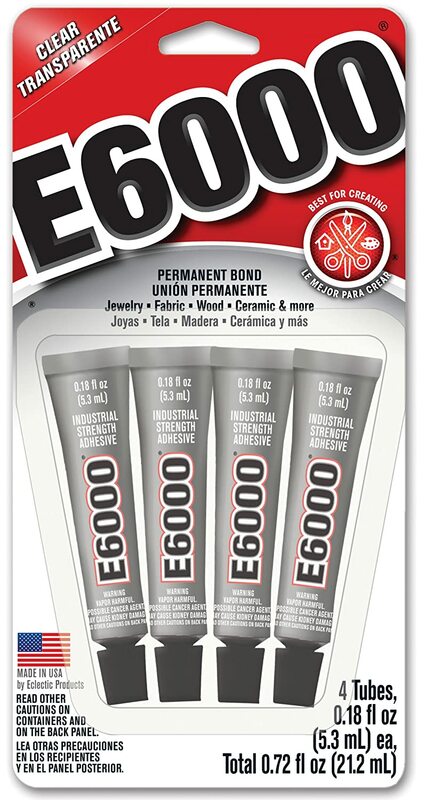 Since it’s become so popular, manufacturers and can create the same look in days that takes natures upwards of 100 years to create. So with so much available, at affordable prices, there are plenty of craft ideas you can make with sea. 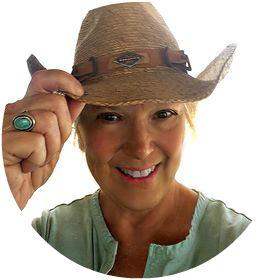 And, I’ve gathered some of the best ideas right here that work really well in creating a coastal decor in your home. 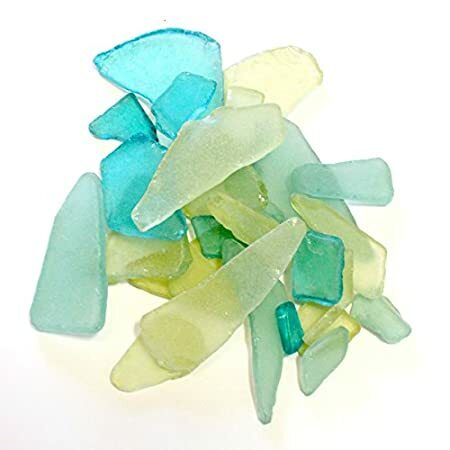 First, Need Some Sea Glass? You don’t have to head off to a coastal vacation to collect your own rock. It’s available in lots of craft and home decor store. But if it’s super simple you want, then ordering from Amazon is the easiest way to get it… and it a variety of colors. I love the colors in this blue, yellow and clear lot below. 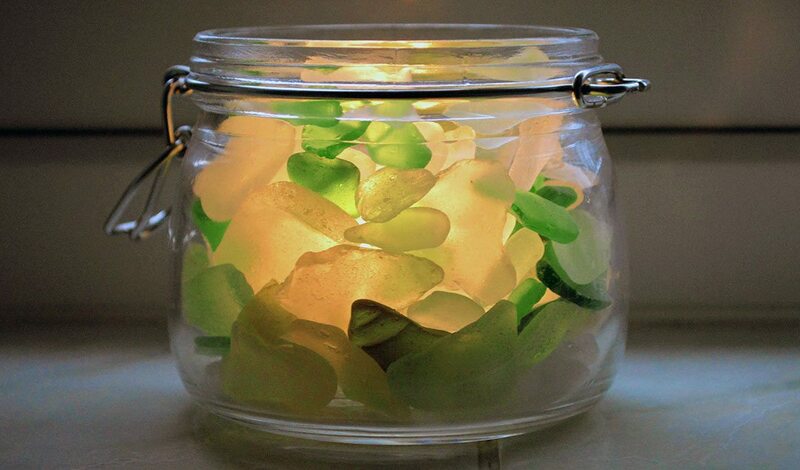 One of the easiest ways to use beach glass is to place a candle on a plate and surround it with the glass. Or, you can take it up a notch and fille a jar with a candle and glass like this idea below. I love the soft colors of the sea glass butter glued to a white rock. Wouldn’t it make a great gift idea? 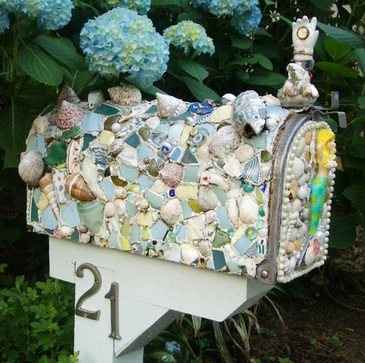 You can also tile a breakfast tray with sea glass. Once the glass has dried, you fill the space with grout. Who wouldn’t like breakfast or snacks served on this? 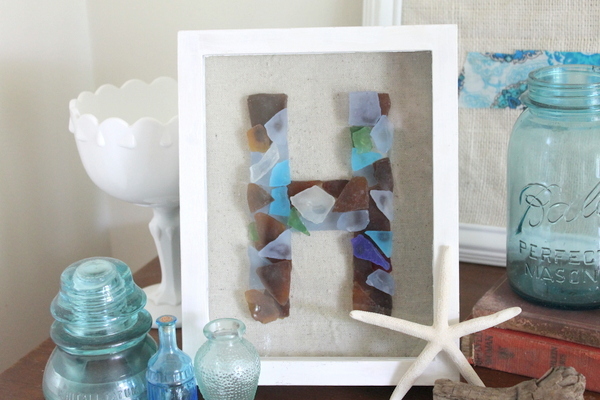 You can easily create a piece of monogrammed art with a shadow box frame and pieces of sea glass. Bathrooms are the perfect locations for a little DIY coastal decor. Just look at this large oval mirror studded with sea glass. What’s amazing is that it’s so easy to make. An old window frame is the base of this beautiful Tree of Live. And it’s a whole lot easier to do that stained glass (I’ve done that, so trust me).It a matter of creating the design and then gluing the piece of glass onto the window. Oh my, this is is so kitschy cool. the little mermaid on the front makes this, don’t you think? 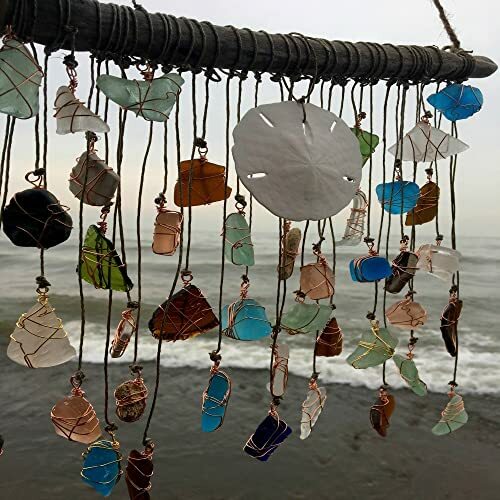 When I think of sea glass crafts, I usually think of mobiles and wind chimes. And often with cooper. This DIY verson is unique, stunning and not hte hard to re-create. Here’s another mobile design I think is cool. It’s uses embroidery hools and the frame and lots of twine to keep everything together. 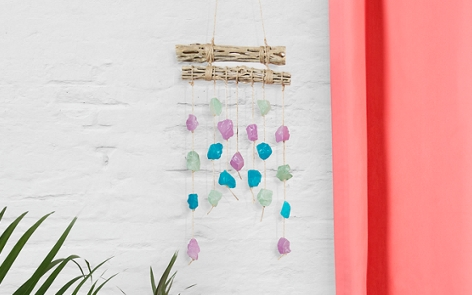 Here’s simple, and short, tutorial on how to make a sea glass mobile. This mobile in Amazon’s Handmade category caught my eye. Everything about ti is perfect. A piece of driftwood. Logts of pretty sea glass with copper details. And rustic jute to tie it all together. And if You Can’t Find Sea Glass… Paint It! Krylon paint has a fantastic new line of sea glass frosted paint, so if you can’t find authentic sea glass (or beach glass), you can make it yourself. Not only can you paint small pieces of clear glass and make a mobile like the one below, you can paint a variety of jars and bottles for your own beach, DIY coastal decor. See the variety of colors here. 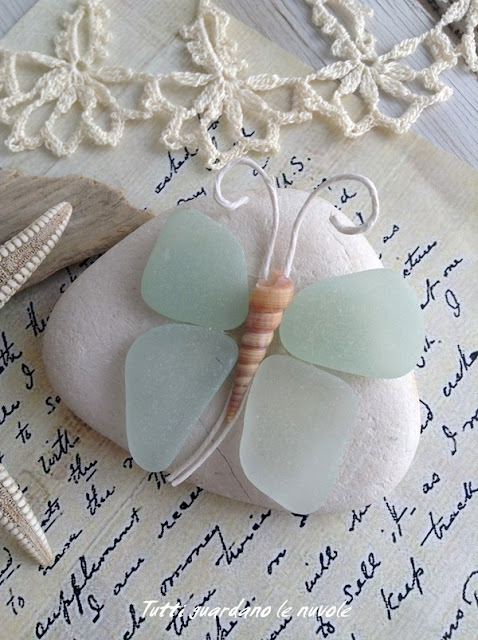 Loving these Sea Glass Crafts? Then How About Some More Ideas? 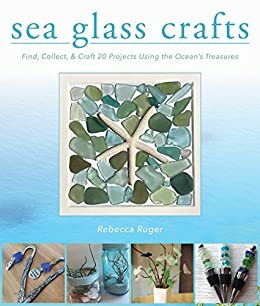 Sea Glass Crafts: Find, Collect, & Craft More Than 20 Projects Using the Ocean’s Treasure is a brand new book and it’s filled with lots of god stuff. Not only will you learn how to find sea glass, but you get 20 projects in this new book.